Adolf Wölfli was born in 1864 in Emmental in Switzerland. He died in 1930 in Berne. He was diagnosed with schizophrenia and spent 35 years of his life in a closed psychiatric hospital. While there he created more than 20,000 large-scale drawings in coloured pencil, embellished with photocollages and texts, in which he meticulously documented a richly-imagined fantasy world. Rilke was inspired by Wölfli’s artistic creations. Max Ernst, Picasso and Miró – to name but a few – soon also recognised his genius and on occasion found wide-ranging inspiration in these works which appear so avant-garde. 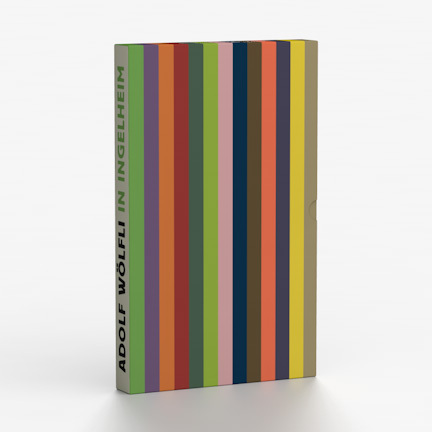 It was only in 1972, more than forty years after his death, that Wölfli first came to the attention of a wider public. The occasion was not an exhibition of the art of the mentally ill, but as one artist among many at ”Documenta 5” in Kassel, Germany. This exhibition gave an opportunity to explore Wölfli’s enigmatic and fascinating artistic world from a different standpoint from that of psychiatry or psychology: the rich artistic legacy of a poor man, a storyteller par excellence, who because he does not understand the world has to invent a new one: as writer, poet, artist and composer. The exhibition is being staged in cooperation with the Adolf Wölfli Foundation, Museum of Fine Arts, Berne. After many decades, this is the first exhibition in Germany to be devoted entirely to the multimedia work of this extraordinary outsider. 19,7 x 32 cm, 248 Seiten. 13 thematische Hefte in einem Schuber.